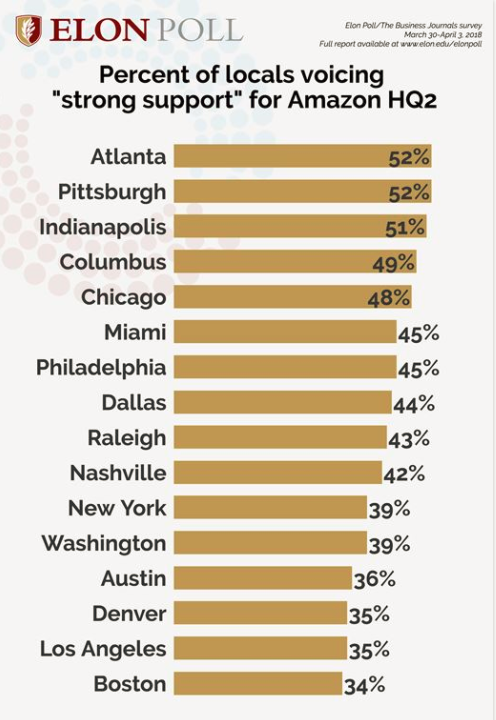 Last week the Elon University Poll took a look at enthusiasm and support for a second Amazon headquarters in the 19 locations in 16 U.S. metros competing for the $5 billion project. The project, which could employ as many as 50,000, has the potential for a huge economic impact. It’s also become a bit of a political football. The competition for a new headquarters has thrown light on the fact that the tech company is a top employer of food assistance recipients. It’s also reignited debates about state LGBTQ protections as the company has said it is limiting its criteria to states that have such laws. The Elon poll found “strong support” for the project from 43 percent of the North Carolinians surveyed — well behind sites like Indianapolis, Pittsburgh and Atlanta, where “strong support” was at over 50 percent. The survey also explored public appetite for large-scale incentives packages and the perceived impact from such a large-scale project as the Amazon headquarters on the local community in terms of real estate costs, cost of living and wages. It asked whether residents want what promises to be an expansive Amazon campus in the suburbs or downtown. Read the full results of the poll with info on methodology here.